The Florida Department of Transportation (“FDOT”) is conducting a study to evaluate alignments for a proposed asphalt multi-use trail facility that will link the Van Fleet Trail to the South Lake Trail Phase I (Clermont/Minneola Trail). Known as South Lake Trail Phases III and IV, the alignment of this new trail facility may largely follow the abandoned Seaboard Coastal Railroad corridor. 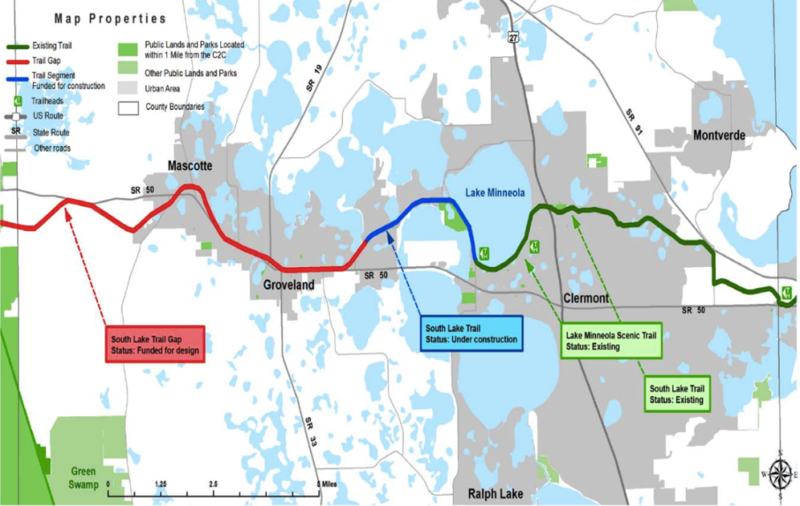 The multi-use trail will extend from the Van Fleet Trail in Sumter County, to the western terminus of South Lake Trail Phase I at West Beach on the southwestern shore of Lake Minneola in Clermont in Lake County, a distance of approximately 14 miles. Phase IV is an 8.0 mile trail that begins at Van Fleet Trail (Withlacoochee State Forest, Sumter County) and ends at Villa City Road (Groveland, Lake County). FDOT has budgeted $9.2 million for Right-of-Way acquisition and $13.8 million for construction. Construction is scheduled to begin Summer 2024. Maguire Lassman, P.A., a Florida law firm that represents property owners faced with the potential acquisition of their property through eminent domain, has access to FDOT’s preliminary Roadway Plans. If you own property in Lake County that may be affected by the South Lake Trail – Phase 4 project and you have any questions or concerns about FDOT’s recently released maps or Florida eminent domain law, please contact Maguire Lassman, P.A.’s office manager, Teri L. Alligood, by email at Teri@Maguire-EminentDomain.com or by telephone at (888) 216-6870.